It was some weeks ago that I was on my way to Recoleta, a barrio in Buenos Aires, to check out Latin America’s largest bookstore. I decided to take the bus as opposed to the underground because the routes are a bit more comprehensive. That day, by chance, a young man asked to sit next to me. He said he could tell I was not from Buenos Aires. I explained that I was from Canada and that I had only been in the city for a couple of weeks. He said that he and his friends ran walking tours of the city and offered to take me on one whenever I had the time. He gave me his e-mail, and I thanked him and got off at my stop. Weeks later, I opened my purse, found his e-mail, and said what-the-heck, why not? I contacted Nicolas and asked if I could take him up on his offer. We arranged to meet on Monday at a hostel where I could join a group he was leading. I arrived at the Ostinatto Hostel, unusually early, and waited for the rest of the group to arrive. The tour we were taking was called Huellas de Buenos Aires, an excursion throughout the center of the city. 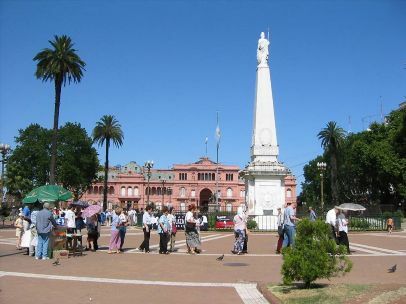 This particular tour focuses on three of Buenos Aires’ major historical events: Peron and Evita, the Military Dictatorship, and Las Madres de la Plaza de Mayo. We set out for the Plaza de Mayo, Nicolas and his colleague, Ignacio, detailing those three events and the impact they had on Argentina’s character. Learning about such atrocities put into perspective the struggle and the power of the people to overcome them. We learned why everyone loved Evita, a fighter for the people. They recounted how the Military Dictatorship throughout the 1970s made 30,000 people just disappear. This act of dictatorial horror created Las Madres de la Plaza de Mayo: mothers marching on the Plaza to demand to know where their children were. To this day, every Thursday, the Mothers still march. Along the way, our guides showed us the old Jesuit school, La Casa Rosada, stained pink with bulls’ blood, and a wall scarred with holes created by shell fragments from the 70’s coup d’etat. Absolutely fascinating and a great way to see Buenos Aires. It’s personal, you can ask questions, and to end the tour, you can enjoy lunch or a beer with your guide. Overall, a great way to spend a day in B.A. For more information you can visit the Cultour website. It has all the details and contact information.